Fabtech’s high quality Billet Upper Control Arms are the ultimate upgrade for increased suspension strength and aggressive offroad use. Built of 6061 aluminum with thick cross sections, they will reduce suspension flex and provide a more positive road feel. These UCA’s feature large PTFE lined 1” ID Stainless Steel Uniball bearings and 17-4 Stainless Steel pins that are designed to handle rugged offroad driving. The Uniballs allow for increased wheel travel when paired with Dirt Logic Coilover shocks. The heat treated Stainless Steel Uniball pin is tapered to fit into the stock BJ taper for an easy return to stock feature. On the frame side of the Billet UCA’s, Fabtech offers two types of adjustable ends depending on your driving requirements. 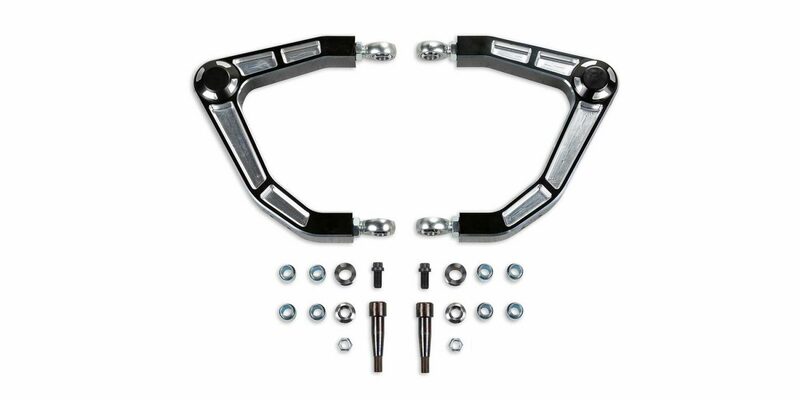 For top level offroad performance, high quality FK 3/4” heim ends are offered to eliminate control arm deflection. These FK 3/4″ heims create a solid mounting point to the frame for the UCA with unsurpassed longevity. Drivers that require a quieter on road ride with less vibration transfer, Fabtech offers forged steel rod ends with Urethane bushings. These provide increased noise and vibration insulating properties compared to heim ends. This is a great option for those that spend most of their time on the highway. The stunning black anodized finish with flawless machine work will make these Billet UCA’s the crown jewel of your vehicle’s suspension.